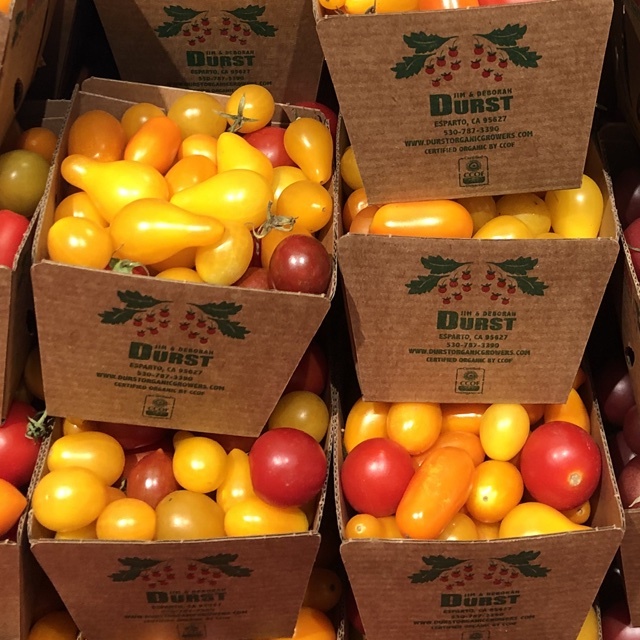 The Yellow Teardrop cherry tomato is similar in texture to a typical cherry tomato but milder in flavor and smaller in size, with a shape like a pear. Hence, this variety is also known as a Yellow Pear tomato. It is tender-firm and thin-skinned, and its juicy texture looks like that of a vine-ripened tomato. It has lots of seeds, and its flavor is rich and sweet. Like most varieties of Teardrop or Pear tomatoes, Yellow Teardrops are heirlooms that grow on indeterminate foliage. The plant produces an abundance of small yellow fruits, about one inch in size, throughout the season, and it grows best in warmer weather. The plants are large, sprawling, and hardy, and often require staking or caging. Yellow Teardrop cherry tomatoes are available year-round. Teardrop cherry tomatoes are an old heirloom variety that has been documented for over 200 years. Originally bred in Europe, it is one of the more popular varieties for home gardeners today. They are not only grown for their sweet taste, but also for their decorative value due to their medley of colors. Teardrop or Pear varieties are named for their shape, which developed from a natural occurring mutation on a cherry tomato plant and distinguished them as a unique cultivar. Tomatoes belong to the nightshade family, along with potatoes, eggplants, peppers and tobacco, and are scientifically known as Solanum lycopersicum or Lycopersicon esculentum. Tomatoes are rich in vitamin A, vitamin C, potassium, and fiber. They contain lycopene, an antioxidant compound that is considered to have cancer fighting and cholesterol lowering abilities. Lycopene may also help protect against heart disease, and help your skin protect itself from UV damage. Yellow Teardrop cherry tomatoes are great for eating raw, and they can be used in place of standard cherry tomatoes in any given recipe for a unique twist. They can be stuffed or broiled, or used in salads, sandwiches, salsas, chili, stews, and casseroles. Their sweetness also lends well to making preserves or jams. They pair nicely with chilies, watermelon, cucumbers, fresh nuts, avocados, zucchini and herbs. Store Yellow Teardrop cherry tomatoes at room temperature until ripe. They can then be refrigerated to slow the process of decay. Tomatoes, or apples of love as they were once known, were introduced to the world following the Spanish conquest of Central America in the 1500s. While they are now a garden favorite and a staple ingredient in cuisines worldwide, tomatoes were originally grown only as ornamental because they were rumored to be poisonous. Despite being grown, many people in North America did not eat them until the mid 1800s, only after Colonel Robert G. Johnson ate not one, but a basketful of tomatoes on the courthouse steps in Salem, New Jersey, disproving the rumors once and for all. The Yellow Teardrop cherry tomato is known to have been cultivated in Europe as far back as the 17th century. It was introduced in the United States in 1847, and soon spread as Joseph Ellis, a vegetable grower, sold one hundred tomato seed varieties, including the Yellow Teardrop, throughout Denver and Utah. In 1889, George Thomas & Co. made Teardrop, or Pear, tomatoes available in their seed catalogs. Teardrop tomato varieties were later featured in the Sun Journal in 1944 and in the Smithsonian Institution's heirloom gardens in Washington, D.C. in 2001. Recipes that include Yellow Teardrop Cherry Tomatoes. One is easiest, three is harder. People have shared Yellow Teardrop Cherry Tomatoes using the Specialty Produce app for iPhone and Android. Sharer's comments : Yellow Teardrop Cherry Tomatoes spotted at Gus Community Market. 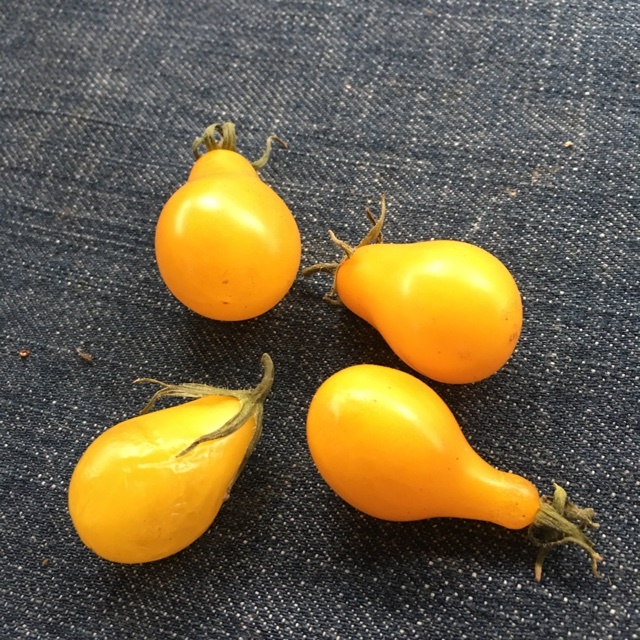 Sharer's comments : Yellow Teardrop Cherry Tomatoes spotted at Mercado Cervecero La Gloria. Sharer's comments : Yellow Teardrop Cherry Tomatoes spotted at Little Italy Mercato.